Carat Australia has appointed head of brand at Yahoo7, Andrea Rule, as its new CMO. Rule replaces Adriana Colaneri who left in February for an MD spot at Dentsu Aegis Network’s full-service global content agency, The Story Lab. Rule held the Yahoo7 spot for five years and is now tasked with heading up Carat’s marketing function. Her remit will include brand positioning, trade marketing and contributing to new business development nationally. Carat CEO Paul Brooks credits Rule’s ‘unique and versatile skillset’ as integral to the decision, with Rule having worked across agency, publisher, and client-side over the course of her career. Rule starts her new role on 19 June, and will be based out of Sydney. Following news in January that former Snapchat staffer Anthony Pompliano claimed the social media empire misreported its metrics ahead of its IPO, the court case has since developed. Back then the company attempted to seal Pompliano's lawsuit, but Business Insider has now revealed that Pompliano is officially opposing the seal. The lawsuit allegedly contains user metrics that he claims are different to Snapchat's published metrics. Pompliano is also asking that the company submit to an independent audit of the metrics. While at Snapchat, Pompliano served as head of growth. Ice-cream company Ben & Jerry's celebrated yesterday's Free Cone Day with the company's first foray in to live stream out-of-home (OOH). Partnering with PHD, Pedestrian, Facebook and Ooh!Media, Ben & Jerry's drove a multichannel campaign that screened people eating free cones in real time. The footage was streamed across QLD, NSW and Victoria and used Facebook's 'accelerated boosting' product which geo-targeted to digital uni screens within 5km of 'scoop' stores. 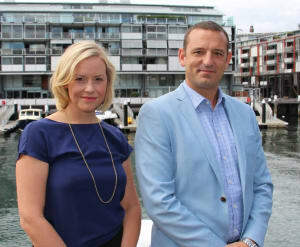 Omnicom media agency m2m Sydney has appointed Brian Seal as head of digital. Seal brings 17 years of digital experience in the UK and Australia in performance digital marketing. Most recently he managed a team of 15 at pure play digital services provider APD. “Brian is a fantastic addition to the m2m team. His knowledge and breadth of experience across a range of industries will be invaluable to us as we continue to grow our business," m2m managing director Wendy Gower says.